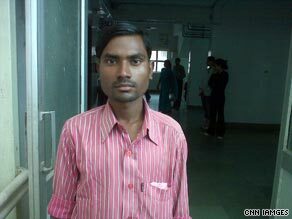 NEW DELHI, India (CNN) -- Doctors at an Indian government hospital on Thursday undertook a critical surgery to save a baby boy born with a heart protruding from his chest, said his father, Chander Majhi. Chander Majhi's son was born with his heart outside his chest and faces complex surgery. Specialists treating the baby at New Delhi's All India Institute of Medical Sciences (AIIMS) have already considered his survival since birth on August 25 a record. Cardiothoracic surgeon A.K. Bisoi didn't want to delay the procedure, given fears the nine-day-old boy -- -- referred to in records as "baby of Vibha," his mother -- might catch a hospital infection. "All roadmaps are ready," Bisoi remarked, insisting the hospital had all life-support systems in place. Doctors replaced the baby's infected blood after he arrived at the hospital, having covered a rough 1,100 kilometer (685 mile) journey in a rickety train compartment. The baby was suffering from acute dehydration when he was taken in, Bisoi told CNN. Bisoi would not say how long he and his 13-member team would conduct the surgery, adding that a one-stage operation could last between an hour and a half and three-and-a-half hours. However, a multiple-stage procedure to put the heart into the chest could take weeks, Bisoi said. Surgeons will be building a home for the dangling heart before attempting to ease the organ in. But the web of vessels prove a dangerous obstacle to work with, Bisoi added. Bisoi called the case -- called ectopia cordis, which only affects five to eight cases in one million live births -- a "lifetime opportunity" that might shed light on how to deal with similar conditions in the future. "You are daring to correct a defect of Mother Nature," he said. Majhi, the baby's 24-year-old father, is filled with hope and prayers and feels indebted to the doctor in his home state of Bihar in eastern India as well as the hospital specialists. The Bihar doctor had not only referred the baby to the hospital but financed the trip. "Life of my son is my biggest wish," he said.